The last bit of wildlife we photographed was this nice Bull Elk. Of course along the way back we saw another bull but he was to far away to do anything with. So we lucked out and happened to see this fellow alongside the road only ten feet from a turn out. 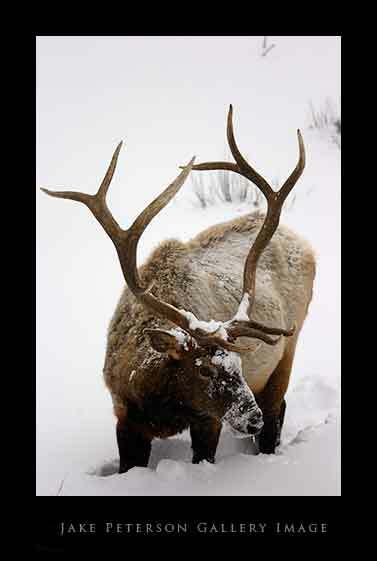 Tyler was quite happy, for he wanted the Bull Elk in winter shot. As I said he was last we photographed but not the least. For on the way back we also saw White Tailed Deer, Rocky Mountain Bighorn Sheep, two more Bald Eagles, and a Golden Eagle dive bombing on some other birds in the fields outside Gardner. All in all an excellent day of shooting.